As I discuss in this answer, by far the most popular school of Hindu philosophy is the Vedanta school, which bases its tenets on the doctrines laid out in the Brahma Sutras, a work by the sage Vyasa that summarizes and systematizes the philosophical teachings of the Upanishads. (You can read the Brahma Sutras here.) But the Vedanta school didn't always have the dominant position in Hindu philosophy; before the time of Adi Shankaracharya the dominant school of Hindu philosophy was the Purva Mimamsa school, which I discuss here. In contrast to the Vedanta school which is devoted to analyzing the Jnana Kanda of the Vedas, i.e. the Upanishads, Purva Mimamsa focuses on analyzing the Karma Kanda of the Vedas, i.e. the Samhitas and Brahmanas. As support for their view, the Mimamsakas adduced the principle that to be a pramana is to reveal things that are previously unknown (anadhigatarthagantri), that fall beyond the reach of any of the other means of knowledge (pramanantaragochara). dharma is clearly such a thing - there is no way other than scripture to know that by performing a certain ritual one will reach heaven - but surely, argued the Mimamsakas, established entities such as brahman fall within the range of other means of knowledge. The Vedantin response was that the Vedas are authoritative with respect to brahman, even though it is a siddartha, because its identity with the Self or the world, as expressed in such statements as tvam brahmeti or sarvam khalv idam brahma, cannot be known by other means. 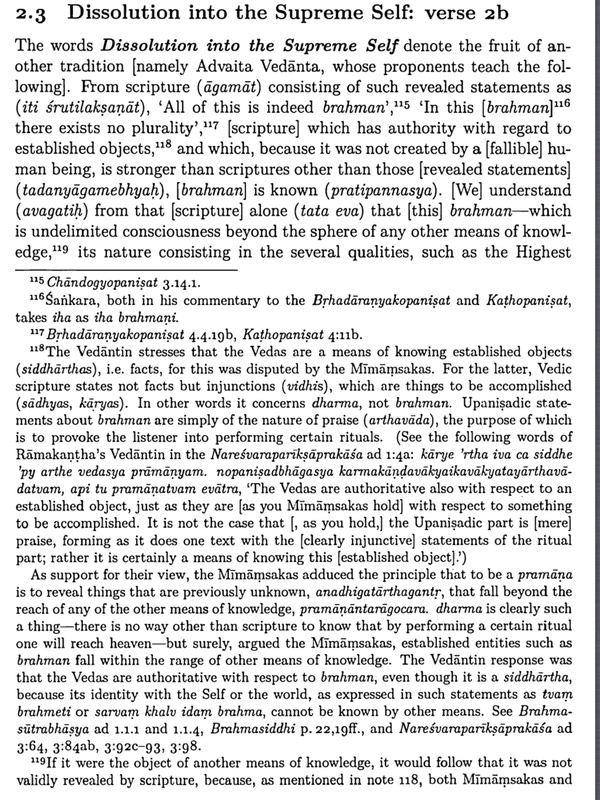 For those who don't know, in Hindu philosophy there are three main Pramanas or valid means of knowledge: Pratyaksha or sensory evidence, Anumana or reasoning, and Shabda or revelation/scripture. And it seems that both the Purva Mimamsa school and the Vedanta school agreed that something is only a valid means of knowledge in situations where it is impossible for the other Pramanas to reveal the truth. Now in the case of knowledge of Brahman, the Vedanta school believed that the Vedas are a valid means of knowing Brahman, because knowledge of Brahman is beyond the reach of both the senses and reason. So only scripture can reveal the nature of Brahman. But my question is about the Purva Mimamsa school's view. Goodall says "but surely, argued the Mimamsakas, established entities such as brahman fall within the range of other means of knowledge". So my question is, does the Purva Mimamsa school believe that knowledge of Brahman can be acquired through the senses or reason? The reason I ask is that as I discuss in this answer, the Purva Mimamsa school often bordered on atheism or agnosticism, so I'm surprised that it maintains Brahman exists at all, let alone that knowledge of Brahman can be revealed by methods more direct than scriptural testimony. Are there any Purva Mimamsa works, for instance Jaimini's Mimamsa Sutras or the works of Kumarila Bhatta, that shed light on Goodall's claim? And if Goodall is correct, then what exactly did the Purva Mimamsa school believe was the method to acquire knowledge of Brahman? Do they believe that he can be perceived by the senses, like a god appearing before you? Or do they just think the existence of Brahman can be established through logic, like the Nyaya school believes (as I discuss here)? Browse other questions tagged vedas philosophy brahman shaiva-siddhanta purva-mimamsa .